“In a global information society where there is a constant race for who delivers the news first, such news undoubtedly fill a need — the need to know. But does reporting on disaster, conflict, international politics or other issues, throw up other questions beyond ‘what happened’? Questions like: What does this mean? How did this happen? How do other communities cope? Are the funds being put to good use? Is the kind of assistance coming in sensitive to different communities’ needs? Which communities are left out from receiving aid and why? 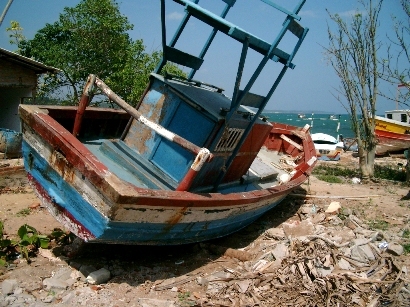 This is an extract from the chapter titled “The 2004 Tsunami: Unfinished Story”, by journalist Johanna Son for Communicating Disasters: An Asia Pacific Resource Book (co-edited by Nalaka Gunawardene and Frederick Noronha, and released in December 2007). 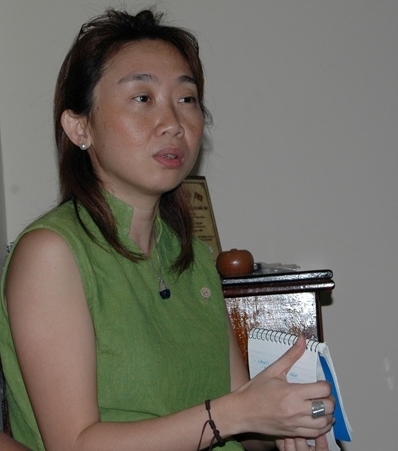 Johanna (photographed below addressing TVE Asia Pacific staff in August 2007), a journalist for two decades, is director of Inter Press Service (IPS) Asia-Pacific, the regional foundation that is part of the IPS international news agency. A Philippine national, Son was previously correspondent and editor for IPS Asia-Pacific, as well as staffer of the Manila Chronicle. “In the following hours, the number kept rising – first to “hundreds” then to “thousands”. Even without much detail and description, it was clear this was quite a different disaster. News desks around the world went into action. “The editor for my region was on holidays in Africa. So I was in touch with our regional correspondent, who was then on holidays in Sri Lanka, and also in contact with a regular contributor from Colombo, as well our correspondent in India. 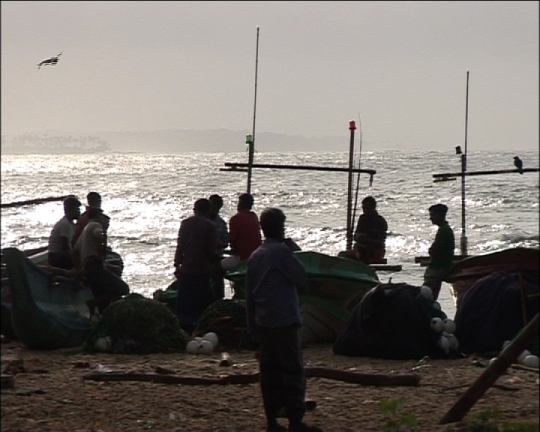 We agreed on a few story angles, trying to focus not on what had already been reported and added little to the avalanche of stories out there, but on how, for instance, the effects of the tsunami interplayed with the ethnic tensions in Sri Lanka. From every disaster, conflict or tragedy emerges a single photograph that captures its essence in a way that becomes iconic. This image, showing the sheer haplessness of those who survived only just barely but lost everything they had, could well be that for the Asian tsunami of December 2004. It was taken by Indian photojournalist Arko Datta, who won the 2004 World Press Photo Award for this image. 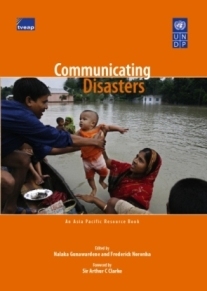 Indian journalist Max Martin (editor of indiadisasters.org) recently interviewed Arko Datta for a chapter in Communicating Disasters: An Asia Pacific Resource Book (co-edited by myself and Frederick Noronha, and just released). The chapter is titled ‘Stop All the Clocks! Beyond Text: Looking at the Pics’, which argues that disaster photography needs to break away from the constraints of time and space. I actually do not plan a frame. I am merely a messenger and do not try to bring in subjectivity or my priorities (in my photographs). I have to be very objective when I am covering any event. I leave the viewers to interpret the pictures according to their perspective. However, of course there are certain parameters I like to follow. I do not like showing corpses or any (image of) morbidity unnecessarily. In natural disasters it is mostly unnecessary; however, in a war, one may need to show the victims as that may be the strongest way of making people aware of the fallout of wars. In a natural disaster, the story is generally about the survivors — their struggle to cope with the loss of their near and dear ones, their struggle to get back to normalcy. It’s the story of their grit and determination to survive and live. The first viewer of my pictures is myself. When I am touched by a situation, I plan to capture it in my camera and show it to others too. So, definitely, as any other human being, I react to every situation too. However, while on work one has to control and restrain one’s emotions, as no productive work can emerge during an emotional state of mind. While covering an event, and covering several events over the years, these emotions keep getting suppressed and bottled up. One needs to know how to tackle this in the long run, or it can deeply effect one’s mind. And everyone has his or her own way of tackling it. I do so by talking to my family and very close friends about my experiences. I feel, on the field, humanitarian workers have their own work to do and the press has its own. The humanitarian workers should not get concerned about the press, as definitely the victims will be their top priority. The press can surely manage on its own. In fact, the press should not come in the way of relief and rescue work. Arko Datta started his professional photojournalistic career in an Indian dailies in Madras and Calcutta. He then worked at AFP, and joined Reuters in 2001. His awards include national photo competition prizes from the Indian government, a prize in the Canon International photo competition, a Publish Asia award in Malaysia, Best Photojournalist of the Year award from Asian Photography magazine in India, the Picture of the Year award in Bombay and awards in the General News and Daily Life categories of the Indian Express Photo Competition. His publications include “Lost Childhood”, a book on child labor sponsored by the International Labor Organization, and his pictures are featured in a coffee table book of the most memorable pictures of India in the last 100 years and in the Reuters picture book “On the Road”. Today is the third anniversary of the Indian Ocean tsunami, which left a trail of destruction in many countries in South and Southeast Asia. Today we remember those who perished and salute those who survived and endured enormous hardships. We thank everyone everywhere who donated to help, and curse those who plundered or squandered the outcome of that generosity. Who or what was in their way. The cartoonists and other media commentators asked a common question: what happened to the land, and the dividing border that both sides had fought so hard and long for? Alas, what Nature proposed we humans (Sri Lankans) disposed. While the tsunami helped usher in a negotiated settlement to the long-drawn armed struggle in Aceh, Indonesia, it only created a temporary lull in the Sri Lankan conflict. As soon as both sides recovered from Nature’s blow, they were back at each others’ throats again. (This contrast has been studied by various groups – see, for example, the summary of a Worldwatch Institute study Beyond Disasters: Creating Opportunities for Peace). Looking back three years later, all I can say is that the land killer waves temporarily and forcibly united, killer human beings have managed to divide again for petty political, communal and personal gains. This boy, Thillainayagam Theeban, epitomizes that bigger tragedy. 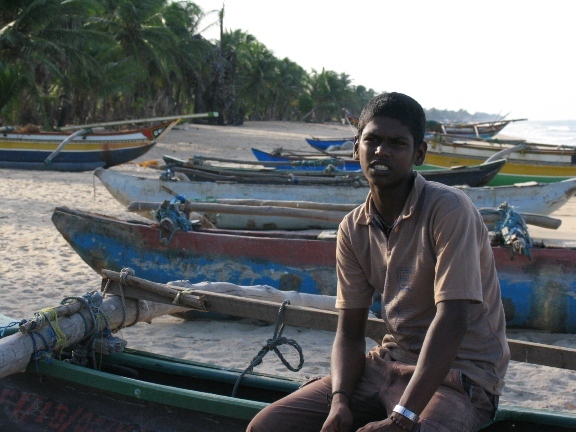 He survived the tsunami — but not the escalation of Sri Lanka’s ethnically driven civil war, which consumed his life in March 2007. 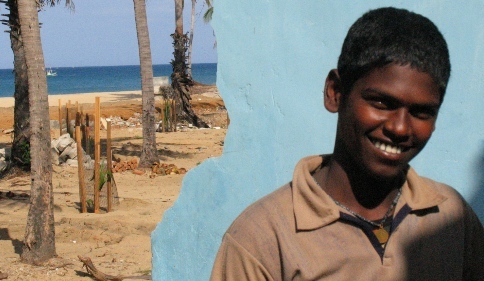 Theeban was one of eight surviving children – from India, Indonesia, Sri Lanka and Thailand – whose remaining families we tracked and filmed for a year in Children of Tsunami media project, a citizens’ media response to the Indian Ocean Tsunami. Theeban was murdered by unidentified gunmen who stormed into his ‘temporary’ tsunami shelter on 3 March 2007. The death was linked to political violence that has engulfed Sri Lanka since 2006. When the shocking news reached us three days later, our Sri Lankan camera team at Video Image and we at TVE Asia Pacific just couldn’t believe it. We were all in tears, and some of us were also angry. Theeban, who survived the killer waves 26 months earlier (but lost his mom and kid brother in the disaster) suffered many indignities in displacement. And now, he is gone. We still don’t know who killed Theeban. He was abducted by an armed group sometime in 2006, from whom he escaped in early 2007. It is believed that Theeban was killed as a punishment for running away — and as a warning to all others. He was 16 years at the time of his death. It is unlikely that his killers would ever face justice. As I wrote in my personal tribute to Theeban in March 2007, published by UCLA’s Asia Media and MediaHelpingMedia, UK: “The disaster’s Sri Lankan death toll (close to 40,000 dead or missing) shocked the world when it happened within a few hours or days. Yet, at least twice as many people -– most of them unarmed and uninvolved civilians — have been killed in over a quarter century of fighting. That doesn’t always grab headlines. The third anniversary of the tsunami is a reminder – if any were needed – that man’s inhumanity to man is often worse than Nature’s fury. I am a word-smith. Trained as a journalist and writer, I play with words (and occasionally make an honest living of it ) — but almost all of my published output over more than 20 years has been in prose. Not yet a creative writer (maybe someday! ), I write mostly fact-based analysis or opinions. One rare exception was when the Asian Tsunami struck three years ago in the last week of 2004. Extraordinary situations prompt extraordinary responses – and I went on to write the only verse I have so far published: When the waves came. I was recovering from chicken pox when the mega-disaster that struck on 26 December 2004. The killer waves spared the Colombo city on the western part of coastal Sri Lanka where I live – and we were extremely lucky. But with close to 40,000 persons dead or missing (which was 1 in 500 of us), it was not a time to heave sighs of relief. We all knew people who were directly affected in one way or another: losing loved ones, suffering property damage, or seeing their jobs go up in the waves. In the days following the disaster, the entire country was a giant funeral house. For a short while, at least, our utterly divided nation of Lanka was united — first in horror and then in grief. I first heard about the disaster on local television – whose newscasters were struggling to make sense of what was happening. Tsunamis were not known in the Indian Ocean until then, and most people had not even heard of the term. Broadcast journalists had to improve with terms like ‘ferocious wave action’, ‘seas flooding land’ and ‘seas spilling over to coastal areas’, etc. As the international news media started reporting the extent of devastation from all over South Asia and Southeast Asia, we realised that Sri Lanka was not alone – even though it had been battered very badly. By Monday 27 December, the scale of the disaster was clearer, and the Sri Lankan death toll was already past 25,000 -– and counting. Search and rescue efforts were now underway, and relief agencies were continually updating their assessments of damage. The grim statistics kept rising by the hour. The global family first watched in shock — and then started to react. Around the world, hundreds of caring people were dropping everything they had lined up for their Seasonal holidays and rushing to volunteer in Sri Lanka and other disaster hit countries. Inspired by the saturation media coverage, especially on television, caring women and men in far away corners of our planet were donating generously for disaster relief support. Children were breaking open their tills in which they’d carefully saved small change for months or years. Church congregations had special collections. Performing artistes were getting ready to have Tsunami aid concerts. Spurred and partly embarrassed by these citizen actions, governments belatedly started pledging massive volumes of aid. The worldwide response to Asia’s tragedy was deeply moving (the bickering and swindling came later). My office (TVE Asia Pacific) was closed that week for Seasonal holidays, but I decided to go in and follow the disaster’s news coverage online (I didn’t have ADSL at home then.) Websites were often giving better coverage than TV channels, and the bloggers were rising to the challenge from many locations in impacted Asia. I spent most of December 27 and 28 in my office. Weakened as I was by chicken pox, I didn’t rush out to help with relief efforts. I knew my limits. Instead, I was emailing regular updates to our friends and partners from many parts of the world who were concerned and anxious about our safety and well-being. Not being a blogger myself then, I was doing it on a one-to-one basis. I slowly came to terms with a deep anguish that had built up since I first heard the dreadful news. I was badly shaken and numbed by the unfolding human tragedy and humanitarian crisis all around myself. No, I didn’t lose a loved one, or suffer personal property damage, but it was impossible not to be moved by the carnage and destruction all around. And at a scale that was unprecedented in my lifetime. For hours on 28 December 2004, I watched the ‘doom and gloom’ television news coverage and monitored news updates online. At that stage, with little news yet emerging from Aceh, Indonesia, Sri Lanka had reported the highest death toll and the greatest damage. It was the biggest disaster in the island’s living memory. When I finally gathered enough sense and wits, I wrote a verse ‘When the waves came’ – it was one way of coming to terms with the calamity. Its basic premise was that the killer waves had been a brutal ‘equaliser’ of all men and women. It no longer mattered on which side of law, morality, economics or social class they stood. The verse was not meant for publication, and was only privately circulated for a few days. One friend who received it, Bircan Unver in New York, wanted to publish it on her Light Millennium website. After some persuasion, I agreed. I wrote this verse with tears running down both my cheeks. I kept on typing, without wiping my face, as words poured out from my grief-stricken mind. This was the least I could do, as my tribute to everyone who perished or suffered by nature’s incredible fury. Writing this verse was cathartic for me. Three years after it happened, I can now disclose what followed my writing of this verse: I closed the laptop, sat down on the floor, and completely broke down. I have no idea for how long I cried: it must have been 20 or 30 minutes. There was no one in the office that day so I didn’t have to subdue myself. Of course, my tears were nowhere near as abundant as those who lost their loved ones to the tsunami. But they were no less sincere. Looking back, I suspect that during those hours of sorrowful solitude, Children of Tsunami was conceived. What do the RMS Titanic, which sank on her maiden voyage in April 1912, and the Asian Tsunami of December 2004 have in common? 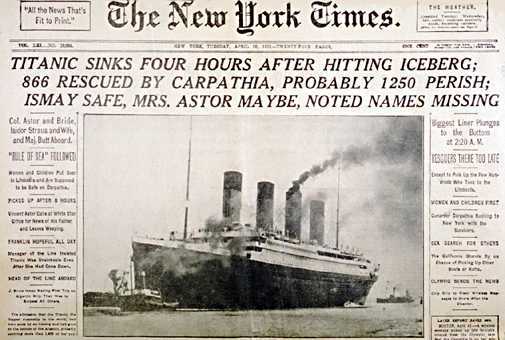 Both were maritime disasters and, when they happened, both shook the world as few others did before or since. 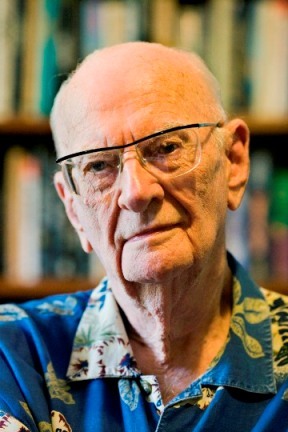 And now, Sir Arthur C Clarke has linked the two tragedies that happened 92 years apart: he says they both illustrate how communications failures can compound the impact of a disaster. Writing a foreword to Communicating Disasters: An Asia Pacific Resource Book (co-edited by myself and Frederick Noronha, and just released), the inventor of the communications satellite revisits the two disasters that left deep impressions in his mind. The Titanic disaster prompted the shipping community to introduce a 24-hour radio watch on all ships at sea. It also consolidated the role of maritime radio in distress signalling and rescue operations. But, as fate would have it, the absence of a timely warning once again characterised the second disaster to touch Sir Arthur’s life. Arriving 10 days after his 87th birthday, the Asian Tsunami of December 2004 left a massive trail of destruction in his adopted country Sri Lanka and several other countries bordering the Indian Ocean. “Astonishingly, a full century after the invention of radio, the Tsunami arrived without any public warning. The disaster’s death toll could have been drastically reduced if its occurrence — already known to scientists — was disseminated quickly and effectively to millions of coastal dwellers living on its predictable path. Even a half hour’s notice would have allowed people to run away from the coast, and in many affected locations there was just enough time to get to safety. But alas, that didn’t happen — and tens of thousands perished. “It was appalling that our sophisticated local and global communications systems completely failed us that fateful day. The communications satellites that I invented, and the global Internet that one of my stories inspired, could have spread the warning, with the hundreds of radio and television channels across coastal Asia amplifying it. Sir Arthur’s perceptive foreword is a sobering counterpoint to the post-tsunami frenzy that we witnessed in the Indian Ocean rim countries. Yes, lacking a tsunami warning system – such as the one Pacific Ocean countries have – is a big gap that needed to be filled. But governments and development donors have rushed into setting up high tech, high cost early warning systems without due consideration for social, cultural and political realities of the intended beneficiary countries. As we saw with some subsequent undersea quakes – such as the one off the resort town of Pangandaran, Java, on 17 July 2006, and the one off off Bengkulu, Sumatra, on 12 September 2007 – we have yet to achieve the right mix of technology, management systems and community preparedness in most coastal countries in Asia. “Communicating disasters — before, during and after they happen — is fraught with many challenges. Today’s ICT tools enable us to be smart and strategic in gathering and disseminating information. But there is no silver bullet that can fix everything. We must never forget how even high tech (and high cost) solutions can fail at critical moments. We can, however, contain these risks by addressing the cultural, sociological and human dimensions — aspects that this book explores in some depth and detail, from the perspective of both media professionals and disaster managers. This is J A Malani. 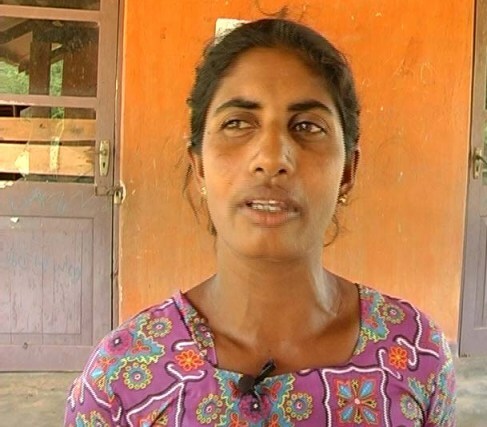 She’s an ordinary Sri Lankan woman living in Hambantota, on the island’s southern coast. Several hundred people in her town perished when the Indian Ocean Tsunami arrived on 26 December 2004 without any public warning. When the waves finally stopped their hammering, close to 40,000 people were dead or missing in the biggest disaster the island nation experienced. Survivor Malani and her neighbours – lucky to be alive – are naturally apprehensive about when the next disaster might arrive, in what form and from where. And this time around, too, they worry whether there would be anyone to warn them about it. There just might be. Since the big tsunami three years ago, several Sri Lankan telecom operators, civil society organisations, IT companies and researchers have come together to test out a community-based hazard warning system — one that would prevent the repetition of the nasty surprise Malani’s community experienced not too long ago. ‘Evaluating Last Mile Hazard Information Dissemination Project’ (HazInfo project for short) was an action research project by LIRNEasia to find out how communication technology and training can be used to safeguard grassroots communities from disasters. It involved Sarvodaya, Sri Lanka’s largest development organisation, and several other partners, and was supported by International Development Research Center (IDRC) of Canada. The project studied which information and communications technologies (ICTs) and community mobilisation methods could work effectively in disseminating information on hazards faced by coastal communities. The exercise was not confined to tsunamis alone; other rapid onset disasters such as cyclones and floods were also covered. In its first phase, the project worked in 32 chosen coastal villages (all impacted by the tsunami) and mobilised local communities from muslim, Sinhala and Tamil backgrounds. Malini’s community was among those participating in this field testing of an approach that Sarvodaya hopes to roll out progressively to all 15,000 villages they work in. That peace of mind is priceless to any human being, and that knowledge is liberating – particularly to one who has survived a major disaster that came from nowhere. Malani is one of several beneficiaries featured in a 12-minute film TVE Asia Pacific recently produced. Several other participants from different coastal locations expressed similar views — and hopes that next time around, they will not be taken unawares. LIRNEasia researchers analysed how each ICT tool or combination was integrated into communities to deliver timely warnings to those designated as first responders. The factors needed for efficient functioning of the hazard information hub were also studied. Read detailed findings and analysis here. The HazInfo project grew out of a participatory concept paper that LIRNEasia developed in the aftermath of the 2004 tsunami. It noted that a national early warning system was a ‘pure public good’, and the responsibility of its supply would normally fall on the government. However, the paper acknowledged that, due to lack of capacity, “it is unlikely that the last mile of such a system will be provided by the local government or private firms operating in the marketplace”. With the third anniversary of the Asian Tsunami drawing close, we are reliving memories of the mega-disaster that hit many parts of coastal Asia on 26 December 2004. On 10 October 2007, I wrote the story of Tilly Smith, the 11-year-old English school girl whose geography knowledge helped save hundreds of lives on the Maikhao Beach in Thailand that day. Here’s another story, which was related by Thyagee de Zoysa, a young Sri Lankan woman who until recently was working as Project Officer of CEE Sri Lanka, a non-profit educational charity that I am associated with. In January 2007, Thyagee spoke at the European launch of TVE Asia Pacific’s latest environmental television series, The Greenbelt Reports</em>, held in Athens, Greece. There she made a passionate appeal for education and awareness to be put into action. “I, myself, am particularly willing to participate in this project, as I was at my home on the 26th of December 2004, with my parents, until we heard a young man crying ‘Run to the temple, run to the hill, the sea is coming’. We ran — and it saved our lives. “The young man told me later that he knew that the sea was going to come with full power because of a film that he had seen. A film, which was about a meteorite impact with earth and how a tsunami happens after that. He knew that, if there comes a day when the sea goes back towards the horizon, it then comes back again to take your life. Neither Thyagee nor the young life-saver could recall the name of the film, but it doesn’t matter. The film left a bit of knowledge in the young man’s mind which surfaced instantly just when it was needed. That helped save lives. 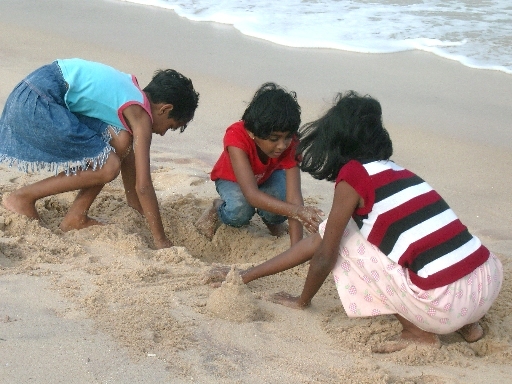 Alas, there were very few Sri Lankans – young or old – who had any idea about tsunamis prior to that fateful Boxing Day 2004. Writing a foreword to Communicating Disasters: An Asia Pacific Resource Book (co-edited by Nalaka Gunawardene and Frederick Noronha), Sir Arthur C Clarke refers to another rare exception: a retired sailor living in the coastal village of Galbokka recognised the tell-tale signs of the on-coming tsunami and rushed the entire community to safety. The challenge we still face is to build everybody’s awareness on multiple hazards and what to do when hazards turn into disasters.